An in-depth report on the causes, diagnosis, treatment, and prevention of leukemia. There are four major types of leukemia. ALL is the most common in children, and the least common in adults. About 6,000 people are diagnosed with ALL each year. Children account for two third of these cases. In general, children with ALL have a better outlook than adults. Most children with ALL can be cured of this cancer. ALL is treated with chemotherapy and, sometimes, radiation. Children receive different chemotherapy regimens than adults. Some people with advanced cancer that has not responded to these treatments may need a stem cell transplant. Practice good hygiene including regular handwashing and dental care (such as brushing and flossing). Eat only well-cooked foods (no raw fruits or vegetables or undercooked poultry, meat, or fish). Boil tap water before drinking it. Do not keep fresh flowers or plants in the house as they may carry mold. Keep up to date with vaccinations. People may benefit from repeat or booster immunizations.
) of the bone marrow. Bone marrow is the soft tissue in the center of the bones, where blood cells are produced. The bone marrow makes white blood cells, red blood cells, and platelets.
. Immature lymphocytes are called lymphoblasts. Malignancy of these blast cells is the source of leukemias. Both leukemia and lymphomas (Hodgkin disease and non-Hodgkin lymphomas) are cancers of leukocytes. The difference is that leukemia starts in the bone marrow while lymphomas originate in lymph nodes and then spread to the bone marrow or other organs. Leukemias are classified based on how quickly they progress and the development of the cells. leukemia progresses quickly with many immature white cells. leukemia progresses more slowly and has more mature white cells. Acute lymphocytic leukemia (ALL) is the focus of this report. All leukemias involve an uncontrolled increase in the number of white blood cells. In acute leukemias, the bone marrow produces an overwhelming number of immature cells. These cancerous cells prevent healthy red cells, platelets, and mature white cells (leukocytes) from being made in the bone marrow. Life-threatening symptoms can then develop. Cancer cells can spread to the bloodstream and lymph nodes. They can also travel to the brain and spinal cord (the central nervous system) and other parts of the body. Acute lymphocytic leukemia (ALL) is also known as acute lymphoid leukemia or acute lymphoblastic leukemia. The majority of childhood leukemias are of the ALL type. Lymphocytes are the body's primary immune cells. Among other vital functions, lymphocytes produce antibodies, factors that can target and attack specific foreign substances (antigens) and fight infections. Lymphocytes develop in the thymus gland or bone marrow and are therefore categorized as either B cells (bone marrow-derived cells) or T cells (thymus gland-derived cells). ALL can arise from either T-cell or B-cell lymphocytes. Most cases of ALL involve B cells. It is likely that ALL develops from a combination of genetic, biologic, and environmental factors. Many leukemias involve genetic rearrangements, called translocations, in which some of the genetic material (genes) on a chromosome may be shuffled or swapped between a pair of chromosomes. Philadelphia (Ph) chromosome is the most common genetic translocation, where DNA is swapped between chromosomes 9 and 22 [t(9:22)]. It occurs more often in adults than children with ALL. ALL that is Philadelphia chromosome-positive is generally more difficult to treat. TEL-AML1 fusion, also referred to as t(12;21) is another common translocation. It generally indicates a favorable prognosis. Other translocations may occur in ALL, including t(17;19) and t(9;12). Acute lymphocytic leukemia (ALL) is diagnosed in about 6,000 Americans each year. Children account for two third of these new cases. ALL is the most common type of cancer diagnosed in children. ALL accounts for about 75% of cases of childhood leukemia. ALL can occur in children of all ages. But it is most likely to occur before age 5 years. It is slightly more common in boys than in girls. ALL is the least common type of leukemia among adults. About 1 in 3 cases of ALL occur in adults. Adults over age 50 have a higher risk for ALL than those between the ages of 20 and 50. White and Hispanic children have a higher risk for ALL than African American children. ALL does not appear to run in families. Still, certain genetic disorders may increase risk. For example, children with Down syndrome have a 20-times greater risk of developing ALL than the general population. Other rare genetic disorders associated with increased risk include Klinefelter syndrome, Bloom syndrome, Fanconi anemia, ataxia-telangiectasia, neurofibromatosis, Shwachman syndrome, IgA deficiency, and congenital X-linked agammaglobulinemia. Previous cancer treatment with high doses of radiation or chemotherapy can increase the risk for developing ALL. Prenatal exposure to x-rays may also increase risk in children. Lower levels of radiation (living near power lines, video screen emissions, small appliances, cell phones) are unlikely to pose any cancer risk. The symptoms of acute lymphocytic leukemia (ALL) may be difficult to recognize. ALL usually begins abruptly and intensely, but in some cases symptoms may develop slowly. They may be present one day, and absent the next, particularly in children. Leukemia symptoms are due to a lack of normal healthy cells in the blood. Some symptoms of ALL are very general and can mimic those of other disorders. Other symptoms are very specific to leukemia. For example, problems with bleeding and bruising are caused by a low count of blood-clotting (platelet) cells. Problems with frequent infections are due to the reduced numbers of healthy mature white blood cells (leukocytes). Paleness. People may be pale and fatigued from anemia caused by insufficient red blood cells. Bruising and bleeding may result from only slight injury. Small red spots (petechiae) may appear on the skin. Pain in bones and joints is common as is abdominal pain and swelling. Swollen lymph nodes may appear under arms, in groin, and in neck. Acute lymphocytic leukemia (ALL) is diagnosed based on various tests. The doctor will examine the person for signs of enlarged lymph nodes or enlarged liver or spleen. The doctor will also look for any signs of bruising or bleeding. A complete blood cell count (CBC), which checks for numbers of white cells, red blood cells, and platelets, is the first step in diagnosing ALL. People with ALL generally have a higher than normal white blood count and lower than normal red blood cell and platelet counts. Click the icon to see a series detailing complete blood count. Blood tests are also performed to evaluate liver, kidney, and blood clotting status and to check for levels of certain minerals and proteins. If blood test results are abnormal or the doctor suspects leukemia despite normal cell counts, a bone marrow aspiration and biopsy are the next steps. These are very common and safe procedures. However, because this test can produce considerable anxiety, particularly in children, parents may want to ask the doctor if sedation is appropriate for their child. A local anesthetic is given. A needle is inserted into the bone, usually the rear hipbone. There may be brief pressure or pain. A small amount of marrow is withdrawn. Marrow looks like blood. 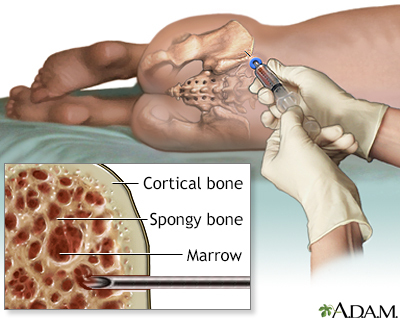 A larger needle is then inserted into the same place and pushed down to the bone. The doctor will rotate the needle to obtain a specimen for the biopsy. The person will feel some pressure. The sample is then taken to the lab to be analyzed. All the results are completed within a couple of days. Normal bone marrow contains 5% or less of blast cells (the immature cells that ordinarily develop into healthy blood cells). In leukemia, abnormal blasts constitute between 20% to 100% of the marrow. If bone marrow examination confirms ALL, a spinal tap (lumbar puncture) may be performed, which uses a needle inserted into the spinal canal. The person feels some pressure and usually must lie flat for about an hour afterward to prevent severe headache. This can be difficult, particularly for children, so parents should plan reading or other quiet activities that will divert the child during that time. Parents should also be certain that the doctor performing this test is experienced in this procedure. A sample of cerebrospinal fluid with leukemia cells is a sign that the disease has spread to the central nervous system. In most cases of childhood ALL, leukemia cells are not found in the cerebrospinal fluid. Cytochemistry, flow cytometry, immunocytochemistry, and immunophenotyping tests are used to identify and classify specific types of leukemia. For example, cytochemistry distinguishes lymphocytic leukemia cells from myeloid leukemia cells. Immunophenotyping shows if ALL cells are T cells or B cells based on the antigen located on the surface of the cell. Cytogenetics and fluorescent in situ hybridization (FISH) are used for genetic analysis. Cytogenetic testing can detect translocations (such as Philadelphia chromosome) and other genetic abnormalities. FISH is used to identify specific changes within chromosomes. Genetic variations may help determine response to treatment. The results of cytogenetic, flow cytometry, immunophenotyping, and other tests can help provide information on types and subtypes of ALL cells. The particular subtype of cell can aid in determining prognosis and treatment. An older classification system called the French-American-British (FAB) classification grouped ALL into L1, L2, and L3 subtypes. A newer classification system classifies ALL B cells or T cells based on their stage of maturity. Acute lymphocytic leukemia can progress quickly if untreated. However, ALL is one of the most curable cancers and survival rates are now at an all-time high. Children have a better chance for recovery than adults. More than 95% of children with ALL attain remission. Among adults, younger people (especially those younger than age 50) have a better prognosis than older people. Initial white blood cell (WBC) count. People diagnosed with a WBC count below 50,000 tend to do better than people with higher WBC counts. The subtype of T cell or B cell affects prognosis. For example, people with T-cell ALL tend to have a better prognosis than those with mature B-cell ALL (Burkitt leukemia). People who have Philadelphia chromosome-positive ALL tend to have a poorer prognosis, although new treatments are helping many of these people achieve remission. Chromosome abnormalities that lead to a poorer prognosis are t(4;11) and t(9;22). People who achieve complete remission (absence of active cancer) within 4 to 5 weeks of starting treatment tend to have a better prognosis than those who take longer. People who do not achieve remission at any time have a poorer prognosis. Evidence of minimal residual disease (presence of leukemia cells in the bone marrow) may also affect prognosis. Other factors, such as central nervous system involvement or recurrence, may indicate a poorer prognosis. (preventive treatment) and is given during all treatment phases to prevent the cancer from spreading to the brain and spinal cord. Chemotherapy is the primary treatment for each stage. Newer drugs known as biological therapies are also being used. Radiation to the brain and spinal cord is also administered in some cases. A stem cell transplant may be recommended for some adults after treatment when there is no active cancer (remission) or for adults and children if the cancer has returned after treatment (relapsed). Enrolling in a clinical trial may be an option for some people. Scientists are working on finding new treatment options for ALL, including difficult to treat subtypes. In 2013, researchers announced promising results from two clinical trials that involved a small number of adults and children with B-cell ALL. The trials tested an investigational treatment called targeted immunotherapy or more specifically, chimeric antigen receptor T-cell therapy (CAR-T). This cell therapy involves filtering T-cells from a person, and then genetically transforming the cells by introducing a special gene. The genetically engineered T-cells are then infused back into the person, where they target and attack the cancerous B cells. As a result of the above research, in August 2017, the U.S. Food and Drug Administration approved Kymriah (tisagenlecleucel) for certain pediatric and young adults with B-cell precursor ALL that is refractory or in second or later relapse. For both children and adults, some of these therapies are administered orally, others intravenously. Hospitalization is usually necessary at some point to help prevent infection and to give transfusions of blood, platelets, and other blood products. However, much of this therapy can be given on an outpatient basis. After the first cycle of induction, bone marrow tests are done to determine if the person is in remission. Another bone marrow test is sometimes performed about a week later to confirm the first results. A bone marrow transplant is considered for select people who do not respond to induction treatment. Both children and adults typically start with a 3-drug regimen. Imatinib (Gleevec) or dasatinib (Sprycel) may be added for people with Philadelphia chromosome-positive ALL. Vincristine (Oncovin), a vinca alkaloid drug. Prednisone or dexamethasone. These drugs are corticosteroids. Asparaginase. It is generally provided as pegaspargase (Oncaspar) rather than L-asparaginase (Elspar) for treating newly diagnosed ALL in children. Anthracycline drug, such as such as doxorubicin, daunorubicin, or epirubicin. Some adult chemotherapy regimens also add on an asparaginase drug or cyclophosphamide (Cytoxan). Rituximab (Rituxan), an antibody targeting leukemia cells with CD20, is often added to chemotherapy in adults under 60 years of age. disease sites). This is called CNS prophylaxis. 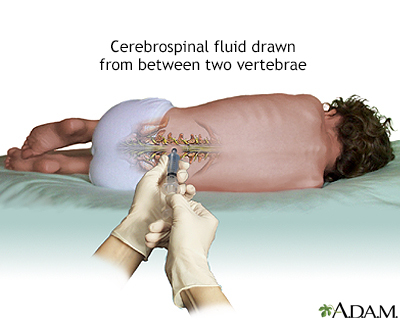 For children, CNS prophylaxis uses intrathecal chemotherapy, in which a drug is injected directly into the spinal fluid. Intrathecal chemotherapy is given with methotrexate (MTX), cytarabine, and hydrocortisone. Some high-risk children may receive radiation to the skull (cranial radiation), radiation to the spine, or both along with intrathecal chemotherapy. This combination can be very toxic and is generally used only in children who have evidence of the disease in the central nervous system at the time of diagnosis. Long-term complications of high-dose cranial radiation can include learning and neurologic problems. Cranial radiation is also associated with increased risks for stroke and secondary cancers. All signs and symptoms of leukemia disappear. There are no abnormal cells in the blood, bone marrow, and cerebrospinal fluid. The percentage of blast cells in the bone marrow is less than 5%. Blood platelet count returns to normal. A complete remission usually occurs within the first 4 weeks. People who show low disease levels within 7 to 14 days have an excellent outlook, particularly if they have favorable genetic factors, and may need less-intensive treatments afterward. People with high disease levels at 14 days or who require more than 4 weeks to achieve remission are at higher risk for relapse and most likely need more aggressive treatment. Side effects and complications of any chemotherapeutic regimen and radiation therapy are common, are more severe with higher doses, and increase over the course of treatment. Administering drugs for shorter duration can sometimes reduce toxicities without affecting the drugs' cancer-killing effects. Nausea and vomiting. Drugs known as serotonin antagonists, such as ondansetron (Zofran) or granisteron (Kyril), can relieve these side effects. Serious side effects can also occur and may vary depending on the specific drugs used. is very common after chemotherapy and can be significant and long-lasting. Combinations of intrathecal chemotherapy plus brain radiation in children can cause some serious complications, including seizures and problems in learning and concentration. The effects of treatment in the brain can affect regions that regulate reproductive hormones, which may affect fertility later on. Chemotherapy, cranial radiation, or both can impair fertility in men and women. Cranial radiation can also result in impaired growth. can occur after chemotherapy, particularly with corticosteroids and after bone marrow transplantation. Some of the treatments increase risk factors for future heart disease, including unhealthy cholesterol levels and high blood pressure. People treated for ALL should be regularly monitored for heart risks. Survivors of childhood leukemia are at increased risk for later stroke, especially if they received treatment with cranial radiation. Survivors of childhood ALL are at increased risk of later developing other types of cancers, including brain and spinal cord tumors, basal cell skin carcinoma, and myeloid (bone marrow) malignancies. Radiation and older types of chemotherapy are mainly responsible for this risk. Newer types of ALL treatment may be less likely to cause secondary cancers. Consolidation and maintenance therapies follow induction and first remission. The goal of consolidation and maintenance therapies is to prevent a relapse. Because there is a high risk of the cancer returning (relapsing) after the first phase of treatment (induction therapy), an additional course of treatment is given next. This is called consolidation therapy (also called intensification therapy). Consolidation is an intense chemotherapy regimen that is designed to prevent a relapse and usually continues for about 4 to 8 months. A limited number of courses of intermediate- or high-dose methotrexate. An anthracycline drug, such as daunorubicin (Cerubidine), used for reinduction followed by cyclophosphamide (Cytoxan, Neosar) 3 months after remission. Extended use of an asparaginase drug. Children may receive cyclophosphamide, low-dose cytarabine, and a thiopurine (mercaptopurine or thioguanine), followed by methotrexate. More intense regimens are used for people at high-risk for relapse. Maintenance therapy typically uses weekly administration of methotrexate (usually in oral form) and daily doses of mercaptopurine. If CNS prophylaxis was not given before, it may be given now. Vincristine and a corticosteroid drug (generally dexamethasone) may be added to standard maintenance therapy. A maintenance regimen is usually less toxic and easier to tolerate than induction and consolidation. Maintenance treatment lasts for about 2 to 3 years for most people with ALL. It is not clear if maintenance therapy benefits people who have certain specific types of ALL, such as T-cell ALL or mature B-cell ALL (Burkitt leukemia). Relapse is when cancer returns after remission. Most people with ALL achieve remission after induction therapy, but in some people the disease returns. Microscopic evidence of leukemia after 20 weeks of therapy (minimal disease). A high white blood cell count at the time of diagnosis. Disease that has spread beyond the bone marrow to other organs. Certain genetic abnormalities, such as the presence of the Philadelphia chromosome. People with high disease levels after 7 to 14 days of induction therapy. The need for 4 or more weeks of induction chemotherapy in order to achieve a first complete remission. Treatment for relapse after a first remission may be standard chemotherapy or experimental drugs, or more aggressive treatments such as stem cell transplants. Children who relapse 3 or more years after achieving a first complete remission usually achieve a second remission with a second round of standard chemotherapy treatments. Children who relapse within 6 months to 3 years following treatment may be able to achieve remission with a more aggressive course of chemotherapy. Children who relapse less than 6 months following initial treatment, or while on chemotherapy have a lower chance for a second remission. In such cases, stem cell transplantation may be considered. Stem cell transplantation is especially considered for children who relapse with T-cell ALL. Adults with ALL who experience a relapse following maintenance therapy are unlikely to be helped by additional chemotherapy alone. They are considered candidates for stem cell transplantation. Stem cell transplantation is also an option for adults, but not children, who have achieved a first remission. Transplantation procedures are reserved for people with high-risk disease who are unlikely to achieve remission with chemotherapy alone. Transplantation does not offer any additional advantages for people at low or standard risk. Many different types of drugs are used to treat ALL relapses. These drugs include chemotherapeutic agents such as vincristine, asparaginase, anthracyclines (doxorubicin, daunorubicin), cyclophosphamide, cytarabine (ara-C), epipodophyllotoxins (etoposide, teniposide), and Marqibo, a specially-formulated type of vincristine injection, for adults with Philadelphia chromosome-negative ALL. Other chemotherapeutic drugs for relapsed or refractory ALL include nelarabine (Arranon), for T-cell ALL, and clofarabine (Clolar), for pediatric ALL patients. Immunotherapeutic drugs include blinatumomab (Blincyto) and inotuzumab ozogamicin (Besponsa), both for B-cell precursor ALL. The most recently approved approach to relapsed disease in the pediatric and young adult population is the use of chimeric antigen receptor (CAR) T-cell therapy, Kymriah (tisagenlecleucel). The drugs known as tyrosine kinase inhibitors (TKIs) are also utilized in the relapsed setting. Tyrosine kinase is a growth-stimulating protein. TKI drugs block the cell signals that trigger cancer growth. TKI drugs approved for adults with Philadelphia chromosome-positive (Ph+) ALL include: Imatinib (Gleevec), Dasatinib (Sprycel), Ponatinib (Iclusig), and Bosutinib (Bosulif). Stem cells that are made in the bone marrow are the early form of all blood cells in the body. They normally mature into red, white, or immune cells. To help the person survive high dose chemotherapy needed to cure leukemia that has returned treatment, or not responded to treatment, a stem cell transplantation procedure may be used. Stem cell transplantation replaces blood stem cells that were lost during the initial chemotherapy treatment. The lost stem cells are replaced by transplanting them from a donor into the person. transplant, the stem cells are taken from another person or donor. The immune system of the person receiving the new cells will usually try to reject these new, foreign cells. The more the donor cells are genetically similar, the less likely the person receiving the cells will reject them. Allogeneic transplants that are from genetically matched sibling donors offer the best results in ALL. With new techniques, donor bone marrow from unrelated but immunologically similar donors is proving to work as well as those from matched siblings.
. Autologous transplants in people with ALL are generally not beneficial, since there is some danger that the cells used may contain tumor cells and the cancer can regrow. Treatment advances that reduce this risk, however, may make autologous transplantation feasible in people without family donors.
. The point is to inactivate the immune system and to kill any remaining leukemia cells. using the stored stem cells, which are administered through a vein. This may take several hours. People may experience fever, chills, hives, shortness of breath, or a fall in blood pressure during the procedure. The person is kept in a protected environment to minimize infection, and the person usually needs blood cell replacement and nutritional support. Stem-cell transplantation is a serious and complex procedure that can cause many short- and long-term side effects and complications. Early side effects of transplantation are similar to chemotherapy and include nausea, vomiting, fatigue, mouth sores, and loss of appetite. Bleeding because of reduced platelets is a high risk during the first month, people may require blood transfusions. Later side effects can include fertility problems (if the ovaries are affected), thyroid gland problems (which can affect metabolism), lung damage (which can cause breathing problems) and bone damage. resulting from a weakened immune system is the most common danger. The risk for infection is most critical during the first 6 weeks following the transplant, but it takes 6 to 12 months post-transplant for a person's immune system to fully recover. Many people develop severe herpes zoster virus infections (shingles) or have a recurrence of herpes simplex virus infections (cold sores and genital herpes). Pneumonia and infections with germs that normally do not cause serious infections such as cytomegalovirus, aspergillus (a type of fungus), and Pneumocystis jiroveci (a fungus) are among the most serious life-threatening infections. GVHD is a serious attack by the person's immune system triggered by the donated new marrow in allogeneic transplants. occurs in 30% to 50% of allogeneic transplants, usually within 25 days. Its severity ranges from very mild symptoms to a life-threatening condition (more often in older people). The first sign of acute GVHD is a rash, which typically develops on the palms of hands and soles of feet and can then spread to the rest of the body. Other symptoms may include nausea, vomiting, stomach cramps, diarrhea, loss of appetite and jaundice (yellowing of skin and eyes). To prevent acute GVHD, doctors use immune-suppressing drugs such as steroids, methotrexate, cyclosporine, tacrolimus, and monoclonal antibodies. can develop 70 to 400 days after the allogeneic transplant. Initial symptoms include those of acute GVHD. Skin, eyes, and mouth can become dry and irritated, and mouth sores may develop. Chronic GVHD can also sometimes affect the esophagus, gastrointestinal tract, and liver. Bacterial infections and chronic low-grade fever are common. Chronic GVHD is treated with similar medicines as acute GVHD. Too much sun exposure can trigger GVHD. It is important for people to always wear sunscreen (SPF 15 or higher) on areas of the skin that are exposed to the sun. When outside, try to stay in the shade. count. This measurement for the amount of white blood cells is an important gauge of a child's ability to fight infection. Counts over 1,000 usually provide sufficient protection so that children can engage in normal activities, including school and other functions where they are exposed to other children. If the count is between 500 and 1,000, the child should avoid large groups. If it falls between 200 and 500, the child should stay at home and should see only healthy visitors who have washed their hands vigorously. Neutrophil counts below 200 indicate that the child is at high risk for infection and should have no visitors. Discuss with the doctor what vaccinations are needed and when. Children with ALL may need reimmunization. In general, it is best to have immunizations prior to chemotherapy and to avoid live virus vaccines during treatment. Be diligent about hand washing and make sure that visitors wash their hands. Alcohol-based hand rubs are best. Avoid eating raw fruits and vegetables. Poultry, meat, fish, eggs, and other foods should be cooked thoroughly. Do not eat foods purchased at salad bars or buffets. In the first few months after the transplant, be sure to eat protein-rich foods to help restore muscle mass and repair cell damage caused by chemotherapy and radiation. Dental hygiene is very important, including daily brushing and flossing. Use a soft toothbrush to prevent gum bleeding. Schedule regular visits with your dentist. Report to the doctor any symptoms of fever, chills, cough, difficulty breathing, rash or changes in skin, and severe diarrhea or vomiting. Fever is one of the first signs of infection. Some of these symptoms can also indicate graft-versus-host disease. Report to the ophthalmologist any signs of eye discharge or changes in vision. People who undergo radiation or who are on long-term steroid therapy have an increased risk for cataracts. Some of the drugs used for leukemia cause extreme sun sensitivity. Sunburn can cause skin infection. Children should wear sunblock and sun-protective clothing when going outside. Baden LR, Swaminathan S, Angarone M, et al. Prevention and treatment of cancer-related infections, Version 2.2016, NCCN Clinical Practice Guidelines in Oncology. J Natl Compr Canc Netw. 2016;14(7):882-913. PMID: 27407129 www.ncbi.nlm.nih.gov/pubmed/27407129. Brentjens RJ, Davila ML, Riviere I, et al. CD19-targeted T cells rapidly induce molecular remissions in adults with chemotherapy-refractory acute lymphoblastic leukemia. Sci Transl Med. 2013;5(177):177ra38. PMID: 23515080 www.ncbi.nlm.nih.gov/pubmed/23515080. Burns M, Armstrong SA, Gutierrez A. Pathology of acute lymphoblastic leukemia. In: Hoffman R, Benz EJ, Silberstein LE, et al, eds. Hematology: Basic Principles and Practice. 7th ed. Philadelphia, PA: Elsevier; 2018:chap 64. Campana D, Pui C-H. Childhood leukemia. In: Niederhuber JE, Armitage JO, Doroshow JH, Kastan MB, Tepper JE, eds. Abeloff's Clinical Oncology. 5th ed. Philadelphia, PA: Elsevier Saunders; 2014:chap 96. Dinner S, Gurbuxani S, Jain N, Stock W. Acute lymphoblastic leukemia in adults. In: Hoffman R, Benz EJ, Silberstein LE, et al, eds. Hematology: Basic Principles and Practice. 7th ed. Philadelphia, PA: Elsevier; 2018:chap 66. Grupp SA, Kalos M, Barrett D, et al. Chimeric antigen receptor-modified T cells for acute lymphoid leukemia. N Engl J Med. 2013;368(16):1509-1518. PMID: 23527958 www.ncbi.nlm.nih.gov/pubmed/23527958. Hunger SP, Mullighan CG. Acute lymphoblastic leukemia in children. N Engl J Med. 2015;373(16):1541-1552. PMID: 26465987 www.ncbi.nlm.nih.gov/pubmed/26465987. Inaba H, Greaves M, Mullighan CG. Acute lymphoblastic leukaemia. Lancet. 2013;381(9881):1943-1955. PMID: 23523389 www.ncbi.nlm.nih.gov/pubmed/23523389. Maude SL, Laetsch TW, Buechner J, et al. Tisagenlecleucel in children and young adults with B-cell lymphoblastic leukemia. N Engl J Med. 2018;378(5):439-448. PMID: 29385370 www.ncbi.nlm.nih.gov/pubmed/29385370. National Cancer Institute website. Adult acute lymphoblastic leukemia treatment (PDQ): Health Professional Version. www.ncbi.nlm.nih.gov/books/NBK65727. Updated March 22, 2018. Accessed April 19, 2018. National Cancer Institute website. Adult acute lymphoblastic leukemia treatment (PDQ): Patient Version. www.ncbi.nlm.nih.gov/books/NBK65844. Updated March 30, 2018. Accessed April 19, 2018. National Cancer Institute website. Childhood acute lymphoblastic leukemia treatment (PDQ): Health Professional Version. www.ncbi.nlm.nih.gov/books/NBK65763. Updated April 5, 2018. Accessed April 19, 2018. National Cancer Institute website. Childhood acute lymphoblastic leukemia treatment (PDQ): Patient Version. www.ncbi.nlm.nih.gov/books/NBK65947. Updated March 30, 2018. Accessed April 19, 2018. National Comprehensive Cancer Network website. NCCN Guidelines Acute Lymphoblastic Leukemia. V1.2017. www.nccn.org/patients/guidelines/all/files/assets/common/downloads/files/all.pdf. Accessed April 19, 2018. Rodgers GM 3rd, Becker PS, Blinder M, et al. Cancer- and chemotherapy-induced anemia. J Natl Compr Canc Netw. 2012;10(5):628-653. PMID: 22570293 www.ncbi.nlm.nih.gov/pubmed/22570293. Santiago R, Vairy S, Sinnett D, Krajinovic M, Bittencourt H. Novel therapy for childhood acute lymphoblastic leukemia. Expert Opin Pharmacother. 2017;18(11):1081-1099. PMID: 28608730 www.ncbi.nlm.nih.gov/pubmed/28608730. Tubergen DG, Bleyer A, Ritchey AK, Friehling E. The leukemias. In: Kliegman RM, Stanton BF, St. Geme JW, Schor NF, eds. Nelson Textbook of Pediatrics. 20th ed. Philadelphia, PA: Elsevier; 2016:chap 495.